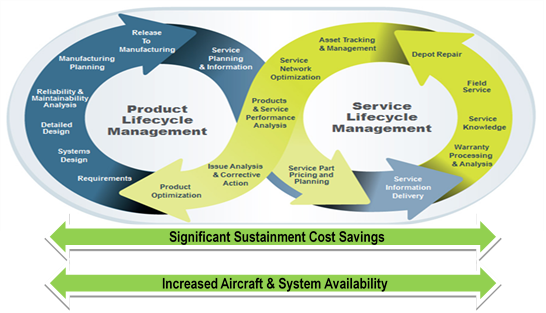 PLM has been defined as “the process of managing the entire lifecycle of a product from inception, through engineering design and manufacture, to service and disposal of manufactured products.” Proper tool implementation ensures that the data which is critical for product development is controlled, and accessible throughout the product lifecycle. PLM is an overall business integration approach providing an end-to-end solution to close the loop between design process and product support. The PLM environment provides a common operating platform enabling multiple departments within the enterprise to work with the same data concurrently. Product developers retain rapid-fielding capabilities and cross-platform compatibility while in-service support maintainers acquire the most up-to-date product information. As Additive Manufacturing (AM) becomes part of the supply chain, there will be new processes and data types to incorporate. These processes can be documented and actualized within any of the PLM tools. Standards for AM are still being developed, and can encompass much more than just part geometry. Establishing an environment that ties modeling, simulation, and all manufacturing data into the AM process enables the enterprise to build a better understanding of the technology and feasibility for widespread application. PLM systems can incorporate processes and capture the data that constitutes the digital thread of NAVAIR systems. The implementation will support a consolidated single source of authenticated information that can be tied into many tools and shared with other IT systems. It is important to evaluate the best overall data management environment, not just what appears to be the cheapest PLM license cost. Total cost is heavily dependent on what other software—especially CAD programs—will be accessing and contributing to PLM both through plug-ins and customizations. Custom software interfaces can have significant long-term costs once regular software updates are accounted for. Additionally, utilizing open standards where possible can help reduce cost and risk. The better defined the data to be managed by the PLM, the more accurate the overall pricing estimates will be. Before the rise of PLM, there was PDM. The software tools that are now integral components of modern PLM systems were initially developed to support PDM functionality. PDM was conceived as a means to make product development more efficient, so its focus was limited to optimizing CAD systems and drawing them into a larger suite of tools to accelerate the overall development cycle. The three main PLM systems available today, PTC Windchill, Siemens Teamcenter, and Dassault ENOVIA, are all rooted in PDM. Although early versions of these applications certainly accomplished their goal of improving the development phase, at the end of that cycle the resulting product design was still dumped “over the wall” to all the downstream processes to fend for themselves just as they always had. Today, these mature software systems have expanded to encompass the entire product lifecycle to fulfill the larger PLM role within the digital thread concept. StraCon can readily assist with the selection, implementation, and population of a PDM/PLM software environments such as Windchill, Teamcenter, and ENOVIA. We have conducted comparative assessments of these three platforms on behalf of NAVAIR to evaluate their strengths and weaknesses. We have also set up and maintained instances of these products for our DoD customers. When it comes to PLM, StraCon can provide solid support for considerations such as licensing, CAD interoperability, requirements management, software development interfaces, and sustainment/scalability. StraCon is the standout choice when it comes to Digital Thread, Digital Twin, PLM, and PDM solutions.